Flat Earth Games' spaceship sim is all about flipping toggles and saying "turbines to speed!" I've got a hold full of helium-3 canisters destined for a station in the Maru sector, but there's a question mark ping on the nav map. Whatever it is—drifting cargo or debris, a merchant or a pirate, or even just a sensor ghost—it's between me and the station. Between me and that mystery object is a gas cloud, and as I cross the border I get a notification about its density: 9%. Objects In Space is the kind of game that tells you the density of gas clouds expressed as a percentage. My sensor wave suggests the ping is something with a reactor, which means a ship, and as I get closer the ship turns red on my display. That means they don't have an IFF active, the friendly handshake protocol that lets anyone passing know your intentions are pure. The dust cloud might be hiding me a little, but not enough, so I hit the EmCon (emission control) button and start running silent, everything lit up red like a submarine. The ship and I get closer and closer to each other, then pass by. It doesn't attack. Whether it didn't see me or was simply a random trade freighter with a malfunctioning IFF I'll never know. All this happens on banks of monitors with a retrotech look a bit reminiscent of Alien. Developers Flat Earth Games call this look "modempunk," everything deliberately clunky and square-edged. 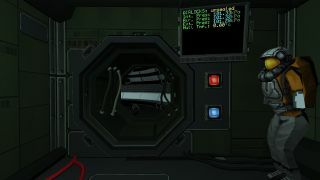 Objects in Space is a game where you never see your ship silhouetted against the stars, never even sit in a cockpit. You move between computers, setting destinations and checking readings and pressing buttons and, if something breaks, unscrewing plates to replace parts. Lead programmer Elissa Harris, a veteran of flight sims like Knights of the Sky and Chuck Yeager's Air Combat, wanted Objects in Space to feel physical. "We wanted that kind of emotional attachment," she says, "like, you knew when and where you bought that busted old ship, jump drive, weapons system or whatever. You repaired it while in the outer rim somewhere that time, too. So when you lose it or it gets damaged, we hope that the player gets to feel it more." ...we'd never release Objects until it was properly finished, no major cuts or compromises. According to lead designer Leigh Harris, her brother, "I think for me it was more about getting to customise and tinker. To go to the engineering section and play around and really make it yours. That side of things always appealed to me in old games like Lightspeed, and I wanted to create that here." The advantage of this approach is that it creates stories another game wouldn't. "Just yesterday I was testing a story mission where I had several torpedoes coming at me," says Leigh, "and one took out my main engine so I couldn't apply reverse thrust to stop myself at the jumpgate and safely escape the Cansa star system. I panicked, ran to engineering, gutted my comms module for a spare Hap Node and quickly shoved it into the main engine just in time to get it working again." It makes me think of Han shouting at Chewie about where his tools have gone while he's pulling the Millennium Falcon's guts out, or any scene on an engineering deck with alarms flashing and sparks flying. As well as simulating what it's like to fly a rustbucket that's a cross between a submarine and a space truck, Objects in Space lets you dock at stations where you trade goods, buy parts, take contracts, and talk to shady characters who might have illegal work for you. Suddenly it's Wing Commander: Privateer, as well as Silent Hunter and also Euro Truck Simulator but, you know, in space. Objects in Space is ambitious, especially for an indie project. Flat Earth Games has been working on it since 2013 and it was in Early Access until recently. As Leigh says, "we started it in late 2013, and at the end of 2014 made a handshake deal that we'd never release Objects until it was properly finished, no major cuts or compromises. Accordingly, we delayed it again and again and again and ran out of money four times during production." As of March 1 it's finally out of Early Access, and with that launch Objects in Space gained multiplayer ("designed for co-op or head-to-head scenarios," Elissa says), mod support, and twice as much "narrative content." Its open world has bespoke story NPCs scattered across it who you can track down to follow their questlines, or you can just plot a course and keep yourself going by buying and selling. Two things keep the scale manageable. One is that space is 2D, a flat surface like in Asteroids or Battlefleet Gothic; the other is that there's a hard three-month time limit on the campaign—after which you can replay it and make different decisions, of course. Even with these limits, it's still more than you'd expect from a studio made of two siblings. ...this had to feel tactile and mechanical, even if you were playing solely with a keyboard and mouse. "We spoke about scaling it down," says Elissa, "but it still ended up massive. At the same time, there was no doubt ever for me that we would finish this by hook or by crook, even if it had to be finished on weekends over years. Which more or less happened at a few stages in development." Objects in Space's specific timeframe means the world feels like it's in motion, independent of your actions. Type NEWS at one of your terminals and you can read up the latest events, whether terrorist bombings or pirate warnings or calls for traders on the outer rim. The people you meet are affected by those same events. "We really explored what non-linear could mean with this game," says Leigh. "There's no main quest line and time is always moving forwards, so we experimented with having NPC quest-givers only exist for periods of time in the game world which were narratively appropriate." Some characters have jobs that depend on exploiting a war between rival space nations, and those jobs will only be available during the conflict. But there needed to be enough missions that players could find things to do no matter the time or place. Leigh explains, "if they spend all their time in Galileo, for example, there has to be enough news, characters and situations in Galileo alone for players to have fun there. Although, having said that, players are meant to fly around and explore. We didn't want a hero's journey where you're the saviour of the universe or anything, but we did want the player to see through the in-fighting, the xenophobia and the regressive politics of the game world—to be unlike the NPCs they encounter who are mostly stationary and have lived in one place most of their lives." It all comes back to the spaceship, the thing that marks the player out, that gives them the freedom to roam the stars and see the bigger picture. To make that ship even more real, there are blueprints on the website players can use to fabricate their own controller setup. Think custom Kerbal Space Program controllers, as an example. If you don't want to use mouse and keyboard you can construct your own consoles, pick up some Arduino microcontrollers and model a mini engineering deck on your desk. At conventions the Harris siblings demonstrate their own setup, complete with toggles and switches just like spaceships on TV. "I remember being really delighted first seeing peoples' eyes light up when they'd walk past us at a show floor, seeing all the blinking lights, rumbling sounds and alarms going off," says Elissa. People liked playing it even more. "The first time people turned the key to boot up the spaceship obviously had a big impact," she says, "and so did flipping up the safety catch and mashing the fire button once they finally got a lock on an enemy in our demo scenarios. To be honest, while we always knew what we wanted to make with the game, for me personally seeing people react to the tactile experience helped solidify that even more—that this had to feel tactile and mechanical, even if you were playing solely with a keyboard and mouse." Having played it that way myself, I can confirm that it does. Closing the airlock doors, smashing the EmCon button, dropping nav points around asteroid fields, it all makes me feel like Wash on Serenity, or Jet on the Bebop. Right now I have to go request permission to undock, then hit burn till I make cruising speed.